Last week’s stormy weather at the Oregon Coast led to some unusual finds on the beach over the weekend, Seaside Aquarium staff said Tuesday. Beachcombers found a dolphin, a porpoise, a shark and a rare fish. “All died recently, and thanks to enormous west winds, blew up onshore with the storms,” said aquarium spokeswoman Tiffany Boothe. The long-beaked dolphin was the first dolphin that aquarium staff have ever seen wash up in the area, even though they are common to Oregon coastal waters, Boothe said. It measured about 5 and 1/2 feet long. 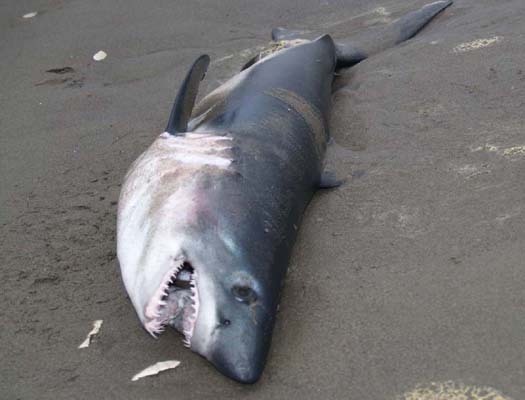 The salmon shark was only about 3 and 1/2 feet long and is a type of shark often mistaken for great whites, although great whites are larger by a foot or more in length. Someone also reported finding a mola mola -- ocean sun fish -- which are rarely spotted on the north coast. The washed-up porpoise measured about 2 and 1/2 feet long. Another beachcomber, Terry Morse of Newport, found a bunch of odd jellyfish, some of which were still alive, he discovered, when he took them back home and put them in a petri dish to study them under a microscope. They began swimming again when put in sea water. The VERY BEST and most researched Aquarium Light information available on the internet.